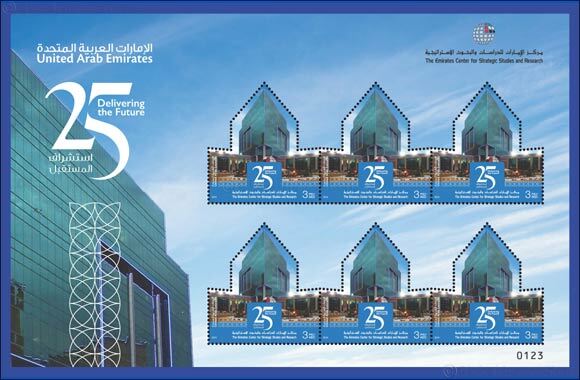 Dubai, UAE – 10 February 2019: Emirates Post has issued a commemorative stamp on the occasion of Emirates Center for Strategic Studies and Research's (ECSSR) silver jubilee. The special-edition stamp celebrates the significant accomplishments of the ECSSR, which has cemented its position as a preeminent think tank since its inception 25 years ago, and supports the plans and vision of our Founding Father, His Highness Sheikh Zayed bin Sultan Al Nahyan. Speaking on the occasion, H.E. Abdulla Mohammad Alashram, Acting Group CEO of Emirates Post Group, said: “Emirates Post is committed to supporting national institutions and we are proud to issue this commemorative stamp to celebrate 25 successful years of the Emirates Center for Strategic Studies and Research (ECSSR). ECSSR's continuous accomplishments, innovation, and leadership has contributed significantly to our country's prosperity. The stamp is available for purchase at all Emirates Post Central Customer Happiness Centres across the UAE from Sunday, 10 February 2019. The first-day sheet is available at a cost of 4 AED whereas the stamp itself will cost 3 AED.